With spring right around the corner, you might be thinking about getting more organized in your home, garage and backyard.Our backyard shed plans are the ideal solution for tidying up the backyard and storing things neatly in their own space. 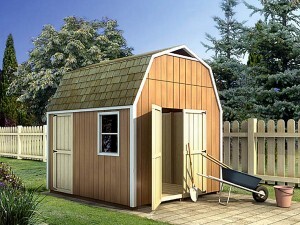 Additionally, shed plans offer the ideal work space for gardeners and DIYers. We have a vast collection of backyard shed plans that offer everything from storage of lawn and garden tools and sporting equipment to potting benches for those with a green thumb. Below are five garage plans from our vast collection. Take some time to learn about these backyard shed plans and find out what we have to offer. 047S-0006: If you’re looking for storage for lawn and garden tools, this basic backyard storage shed is sure to fit the bill. There’s plenty of room for the lawn mower, fertilizer, hedge trimmer, shovels, rakes and the like. It’s simple design blends nicely with most homes and features a double door entry in front as well as a side service door. If you’re not looking to store lawn and garden tools, this shed plan is also suitable for storing the family bikes, sporting equipment or even patio furniture during the winter months. The blueprints are available in five sizes allowing you to build the right-sized shed for your space and needs. 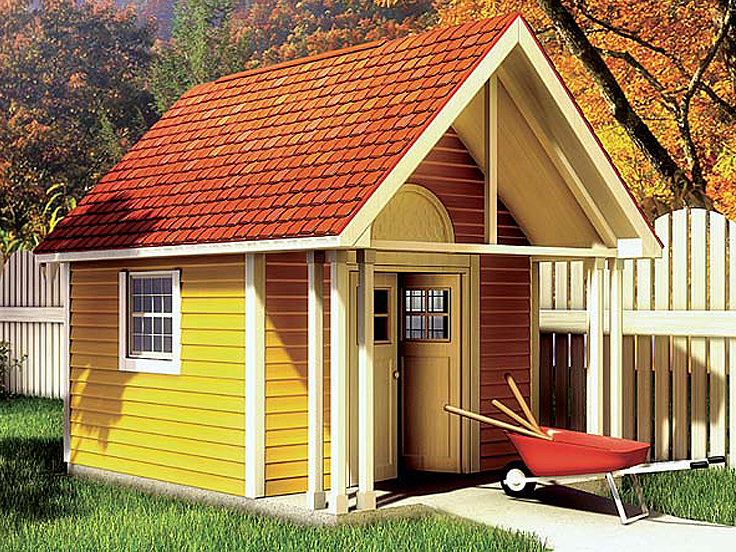 062S-0001: Here’s a backyard shed plan that does double duty. 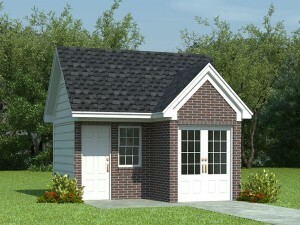 The storage shed area features a double door entry making it easy to move large and bulky items in or out of the shed. There is plenty of room inside for organizational shelving or storing seasonal items like sprinklers and hoses. It is also large enough to accommodate items such as a pair kayaks or an ATV. A workshop area is attached to the shed giving the family handyman a place to store tools, work on small home improvement project or wood crafts. Windows offer plenty of natural lighting in the workshop. 072S-0020: For those who enjoy starting their own summer gardens from seed, this shed plan with attached greenhouse provides an excellent place to start growing your vegetable plants in early spring so they can be transplanted into the garden in late spring or early summer. The greenhouse area offers ample space and plenty of natural light for growing while the storage shed area offers room for extra pots, potting soil, gardening shovels and more. Avid gardeners will appreciate this thoughtful design allowing them to keep everything they need for growing flowers and vegetables in one place. 050S-0005: Gardening enthusiasts will love this backyard potting shed. It is designed to keep all your gardening tools and supplies in one place. This eliminates a mess in the garage or basement. 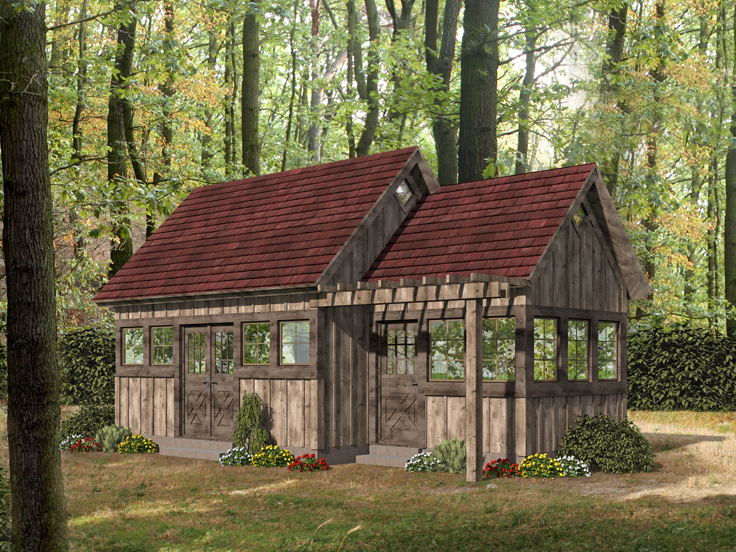 This potting shed plan offers a utility sink and plenty of room for counters and workspace. There’s even enough room in the middle to add a work table if you prefer. Neatly store pots, shovels, fertilizer, and seeds in this shed and organize your gardening workspace in a manner that is functional for you. 028S-0008 : This backyard storage shed plan has more to offer than you might expect. The main level provides enough room for shelving or storage cabinets for all your lawn and garden needs. Or, if you have a family, it provides plenty of room for the kids’ baseball bats and gloves, scooters, kites, and other outdoor toys. For others, it provides a great place to store woodworking tools and supplies. Still others might use this backyard shed for storing pool chemicals and accessories like rafts and diving sticks. Now take a look above. The attic storage is ideal for stashing seasonal items like holiday lights and other holiday décor. 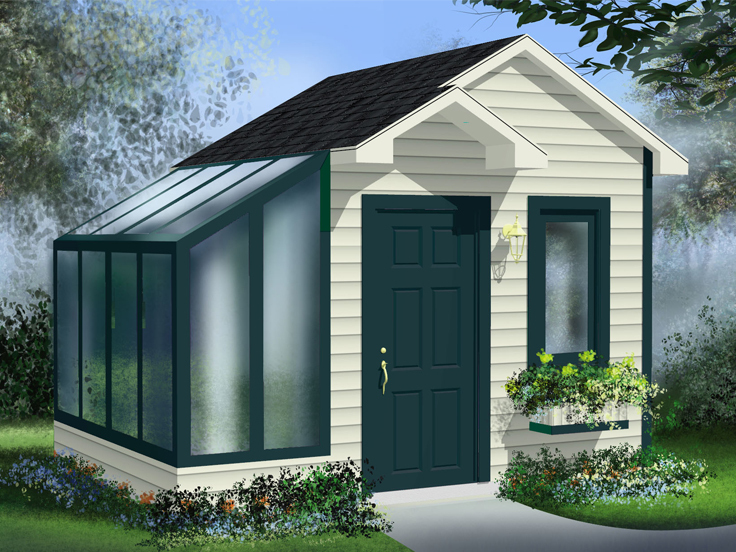 The widows and covered porch are thoughtful extras that help this practical shed blend neatly with your home. 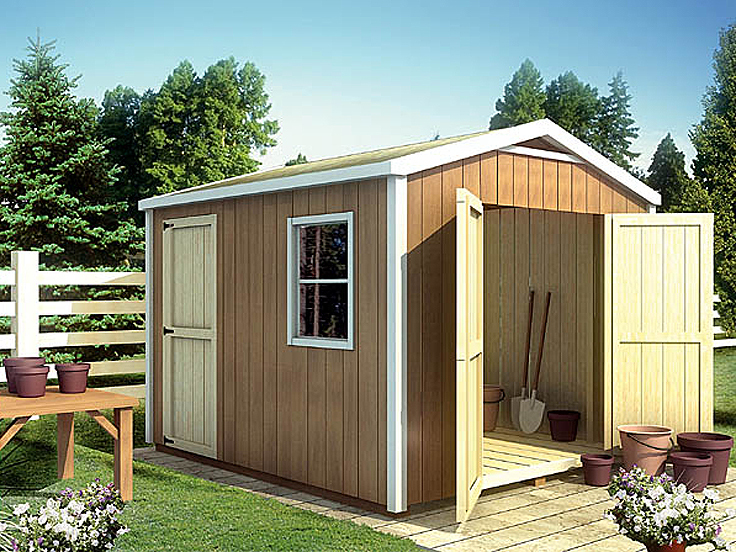 Our extensive collection of shed plans includes many designs available in a variety of sizes and styles. If you’re looking for something a little bit larger than a backyard shed, you might want to consider some of our outbuilding plans. Clean – At the end of the season, gather items together by usage, like gardening tools, the kids’ toys, grilling equipment. Cover what needs to be protected from the elements and stow away the rest. Treat your clean garden tools and mower blades to a coat of oil or lubricant to keep them from rusting. Stow it – Designate one area of your garage or basement just for storing outdoor items. If you are maxing out your garage storage or just tired of toting items up and down the basement stairs, consider investing in a shed or purchasing a storage shed of shed blueprints and building your own. Organizing here is easily accomplished with shelves, pegboards, hooks, and storage containers. Use see through containers or labels to save time when locating and retrieving items. Down Under – Additional storage space may be found and used under porches and decks. You may want to install some lattice work to help keep it out of sight. Reel it in – To keep hoses from becoming unsightly, dangerous tangles invest in a hose reel. Not only does it keep it in its place, it helps drain the water out of it for winter storage. Pave it – If you have a beaten path in your lawn because it is traversed so often, like the route to the trash cans or pool, consider setting some pavers or stepping stones. It will save time and money from constant reseeding or sodding and as a bonus, keep you on track. At some point in time, most home owners decide they need or want a backyard storage shed of some sort. Sheds often prove to be a valuable addition to most homes and properties. They are useful for storing lawn and garden tools and equipment, they work well for workspace for hobbies and even provide storage when space inside the home is limited. Many home owners opt to build their own backyard storage shed using shed plans. However, the ultimate outcome will depend on his or her DIY and carpentry skills and how complex or difficult the shed plan is to build. There are several steps you can take to get started building your shed and ensure a successful outcome. 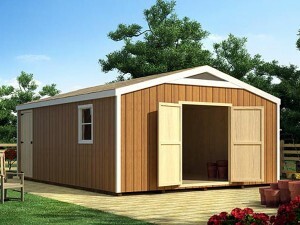 First, determine the purpose of your future storage shed. Do you plan to store tools, lawn and garden supplies, outdoor furniture during the winter months, the family bikes and outdoor games/toys? How will the shed be used? Next, contact your local building department to find out if you need to obtain building permits to build your shed. If so, find out what is required to obtain the permits and if there are any regulations such as size or height. Some cities/municipalities have very strict zoning regulations that will establish what size shed you can build, where it can be positioned on the property, etc. Note: There have been occasions when homeowners have built a backyard shed and have been fined or forced to take the building down for not obtaining permits or following local building laws and regulations. After your building department has established the regulations for size, location, etc., for your new shed, you can begin considering the best size shed to accommodate your needs and the best location on your property to build the shed plan that are within the established guidelines. Choose a shed plan that will accommodate your needs, satisfy building regulations and fit on your lot in the determined space. Next, clear your lot if necessary. Typically shrubs and trees are cleared away and the lot is leveled. Check with utility companies before you begin digging to make sure your building site will not interfere with utilities such as water and electrical lines. Furthermore, you do not want to risk the chance of digging them up or damaging them. If necessary, ask the utility companies to come out to your property and mark the location of utility lines. If you plan to run utilities to your shed such as electrical lines for your power tools, consult with your electrician or other utility professional. Are you thinking about adding a lawn and garden shed or a storage shed to your backyard this spring? If so, this shed plan has plenty to offer. 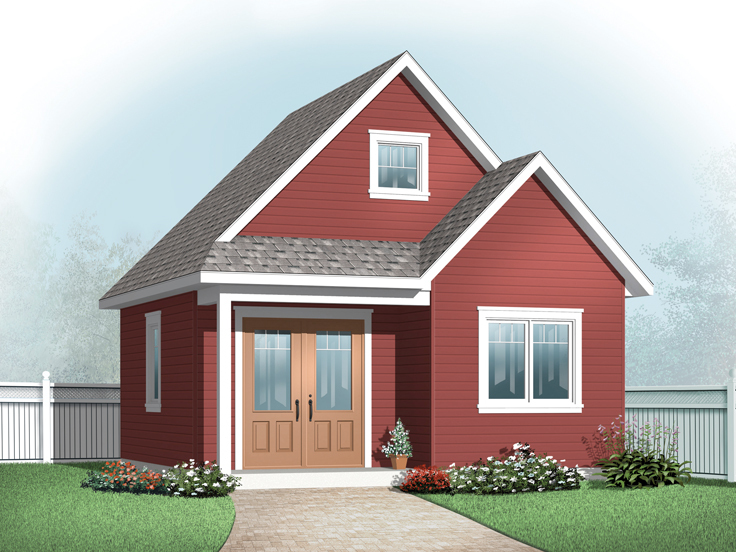 The design features a gambrel roof giving it the looks or a miniature barn. Double doors allow easy storage of large or bulky items such as the riding lawn mower, the family bikes or plywood and lumber for craft projects. The side entry door adds convenience. Whether you need to store lawn and garden items like the leaf blower, rakes and potting soil or you are looking for a place to organize outdoor toys and sporting equipment for the kids, this backyard storage shed plan will help keep your yard tidy. Woodworkers, mechanics and tinkerers may find this shed plan handy for safe, dry storage of tools, auto parts and crafting supplies. This plan is available in five different sizes ensuring you’ll find just the right one to satisfy your needs and fit neatly into the corner of your backyard. Choose from the following sizes: 8’x12′, 10’x12′, 10’x14′, 10’x16′ and 12’x16′. 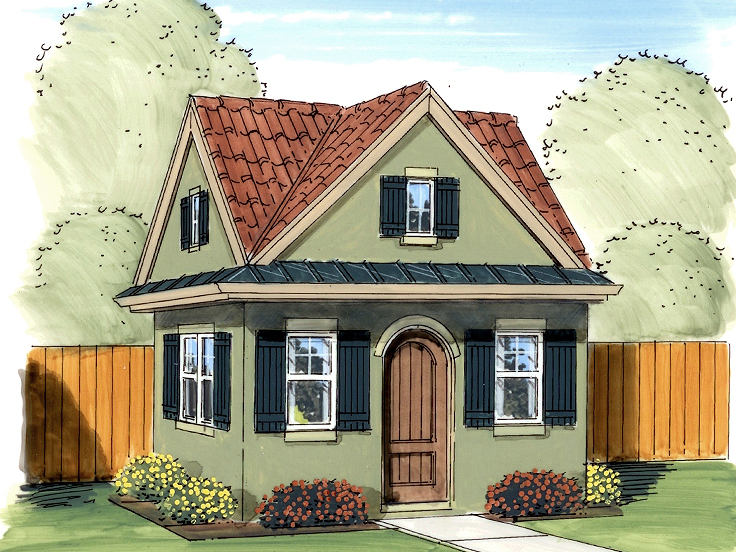 For more designs like this one, check out our entire shed plan collection. If your motorcycle is your prized possession, chances are you don’t want to store it in your garage where there is a lot of activity. Face it. Typical garages might be a good place to protect your cars from the elements or store lawn and garden tools, outdoor games for the kids, bikes and other items, but do you really want to take the chance or getting a scratch or a ding on your motorcycle? This motorcycle garage plan is the perfect solution. Because it is designed for a bike, you’ll be less likely to store anything else inside, therefore having a place to protect your motorcycle from Mother Nature’s fury and ensure it doesn’t take any other “abuse” from everyday family activities in the car garage. A service entry allows easy access inside and a pair of double doors works well for pulling your motorcycle in and out of the garage. Small in size, this motorcycle storage garage fits neatly into most backyards. Now, if you’re not a motorcycle enthusiast, chances are you don’t own one. In that case, this motorcycle garage would work well as a backyard storage shed or garden shed giving you plenty of room to store lawn and garden equipment, fertilizer, potting supplies, etc. Its flexible design allows for other uses besides cycle storage, and its traditional charm allows it to blend nicely with a variety of homes. If you are looking for flexibility, this motorcycle garage plan or storage shed plan is ready to accommodate your needs. Browse all of garage plans and shed plans to find the one that is right for you.